If you are a blogger, you are probably already aware of the term ‘affiliate marketing’. Affiliate marketing is where you promote a product on behalf of someone else. If one of your audience clicks on your sales link and buys the product, you make a small commission. It doesn’t cost your reader any extra. The most common affiliate scheme is that of Amazon. It’s highly likely that any Amazon links you see in blog posts make a small profit for the website owner. Amazon typically pays out small amounts per sale. There are, however, other products that are higher priced items that also have affiliate schemes. If you want to make affiliate sales, you have to get people to click on your affiliate links. How do you do that? 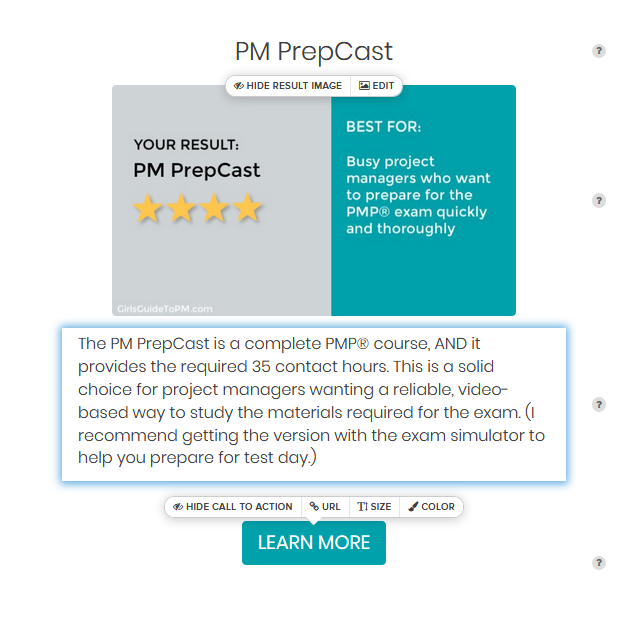 In this article I’m going to show you how to do that final option – how to use quizzes to direct people to products that are perfect for them. Think about what quizzes are used for. They help direct people to a single answer. That could be the cocktail that is most like them, the career they are most suited for, what type of mom blogger they are. How about if your quiz helped direct people to the product that was right for them? If your customer doesn’t know what kind of food processor to buy, or what credit card is right for them, you could guide them to the right solution through a quiz. Tip: Your quiz has to be helpful! If you are only an affiliate for one type of food processor, don’t use ‘what food processor should you buy’ for your quiz and direct people to the same link regardless of what they enter. All the answers have to be different, and tailored to the questions you ask. Remember that people often go through a quiz multiple times clicking different answers so they can see all the answers! If you are an affiliate for a number of related products, and your audience are always asking you which would be the best for their individual circumstances, then you’ve got a good candidate for a popular and helpful quiz. Ideally, you should be looking for high-ticket affiliate products to sell through a quiz format. You can obviously create a quiz for any set of items, but lower paying affiliate schemes like Amazon are going to net you lower revenue. Choose products that are at the higher end of the investment scale and where the affiliate scheme pays out a decent amount for each successful referral. No one is going to do a quiz to work out which pair of socks or book to buy, but they might do one for a bed, kitchen gadgets, and other higher priced items. You can track your income from affiliate products using my blog financial planner workbook, so you can test out which products are likely to make the best return and the best option for a quiz. There are strict guidelines about declaring affiliate and promotional links. In the UK, the Advertising Standards Authority in the UK has produced a guide for influencers. The Competition & Markets Authority has a guide to social media endorsements. The FTC also has guidelines for what you should and shouldn’t disclose for US businesses. Regardless of where you are in the world, the ethical thing to do is disclose that you are sharing affiliate links. You should add appropriate wording wherever your quiz appears. Here’s how the landing page for my quiz looks as it is embedded on my website. Right. So you’ve got an idea for a quiz where you can direct people to at least four possible products that are a good fit for their needs. 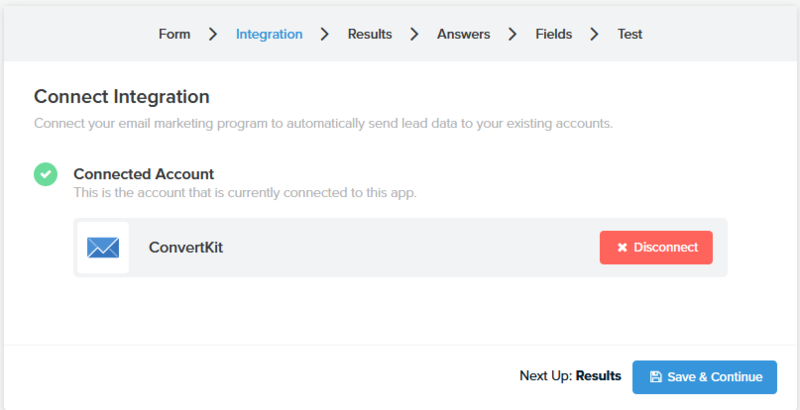 I’ll show you how to build a quiz with Interact. First, make sure you know what affiliate products you will be promoting as the answers to your quiz. You can then work backwards from there to make your questions relevant and helpful. You will very quickly lose the trust of your audience if you direct them to products that don’t meet their needs. 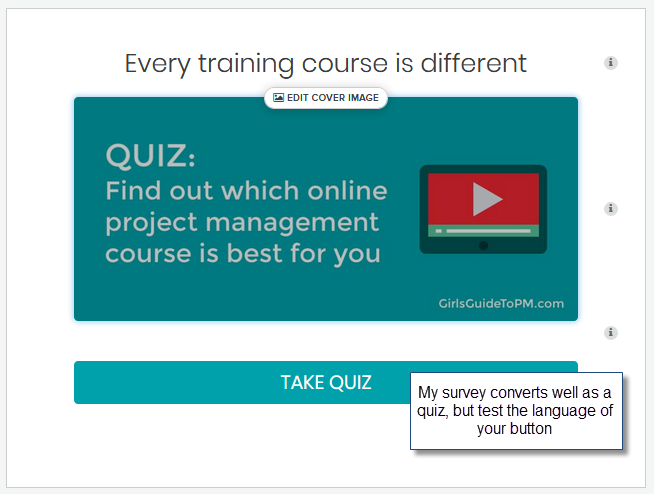 From your Interact dashboard, select Create Quiz. If you have never made a quiz before, choose the option to use a template. Personally, I think affiliate promotion quizzes are quite an advanced strategy, so you might want to test out some other more basic, lead-generating quizzes first. Choose a template. You can edit any of the templates you see on the site so your finished quiz doesn’t have to look like what you select. However, I find it easier not to start from scratch. A Personality format quiz is a good option for your affiliate promotions. Make a few quick selections to edit the branding to match your site colours. You can always come back and tweak it later. Upload your logo. This will appear on the quiz in the bottom right-hand corner. Now create a title for your quiz. This should be something clear and concise so the reader knows exactly how the quiz will help them. Be obvious! This is no time for clever or witty headings. Something like ‘Which is the best food mixer for you?’ makes it clear to the reader that this set of questions will help them work out which is the best food mixer for their circumstances. Adding a picture to your cover can also help orientate the reader so that they know what they’ll get at the end of the quiz. You could make a collage of possible outcomes or use one big bright picture that sums up the content of the quiz. Use the space for the description to add a single compelling line explaining why people should take your quiz. You can also change the button text to something like ‘Find out now!’ or ‘Take the Assessment’. Test out different button texts to see what gives you the best click through rate. You might find that different wording works best with different types of quiz, and not calling it a quiz might also be beneficial – you’ll only know if you test your audience. The next step is adding your answers. The quiz template will already have answers pre-populated (if you are starting from scratch you will have to add your own). Edit the text to showcase your product solutions for your quiz takers. Add an image of the product as well, so that people can see exactly what they have been recommended. The title should be the name of the product you think is the best fit for them. Make the description a compelling statement about the product so that the next natural step is for the reader to buy the item. Finally, make sure your call to action button is linked to where the quiz taker can get the product. This is where you put your affiliate link. Remember: The reader should know it is an affiliate link before they click it to ensure you keep your blog compliant with disclosure guidelines. If you don’t want to add an affiliate link at this point, you could also direct people to a blog post or product page about the product. You can embed your disclosure and affiliate link into that page. 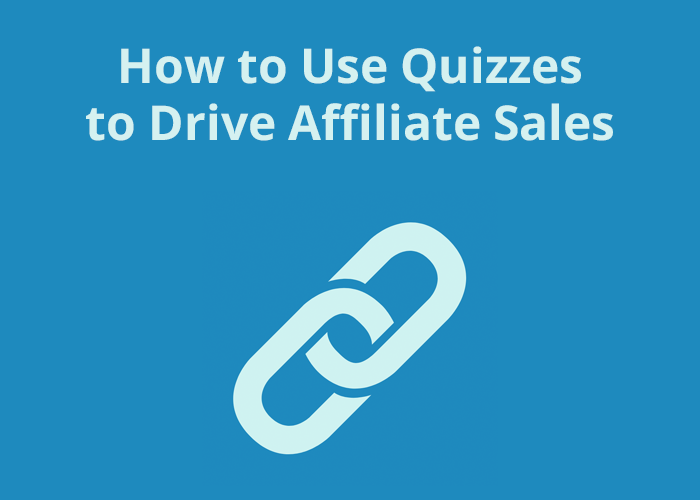 This is an alternative for if you don’t want to include affiliate disclosures and links directly into your quiz, but the downside is that readers have an extra step to go through before they reach the link. They may simply decide to use the results of your quiz and then put the product name into a search engine. In that case, you would lose the affiliate sale. As with all ways of growing your business and generating revenue, it’s worth doing some controlled tests to find out which option converts best for your readers. Now it’s time to create the questions that guide your reader to the product that is the best fit for them. Work out your question order and answers before you start entering them in the system. You need to know which answers link to which product. Affiliate quizzes are good places to use branching logic, but if you aren’t sure about how to do this, here’s a good article that steps you through using conditional logic. The picture below shows the branching logic for my quiz. Ultimately, you are trying to create questions that lead naturally towards a product that is helpful for your reader. You’ll want to ask about their situation, how they would use the product, what features are important to them about the product and so on. In the example from my quiz below, I have used image responses with a text description, but you can easily switch between pictures and text responses. For some products, it might be appropriate to have pictures of similar products and ask what the reader prefers, for example. When you have your question entered, you then have to add the answers. Link the answers to the end products you are recommending. 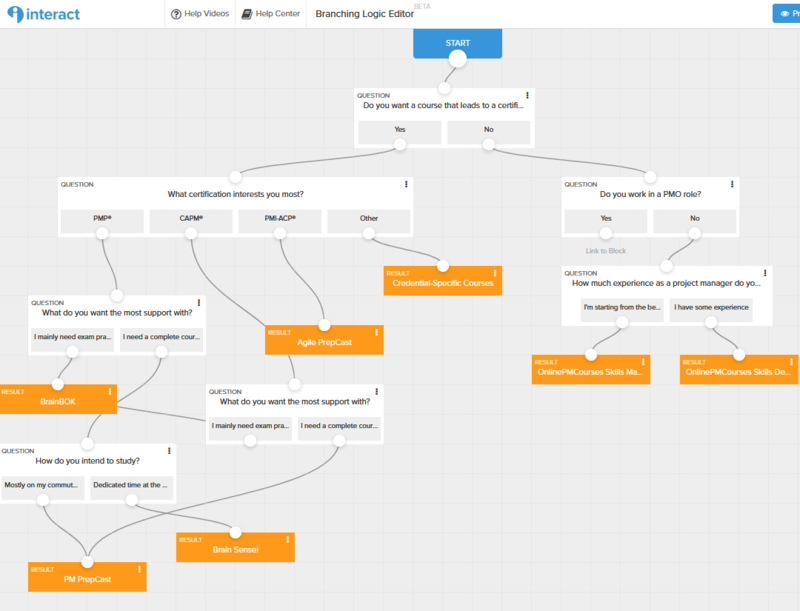 If you use branching logic, check the branching logic editor to make sure all the answers go on to link to a product. It’s easy to end up with a few complicated pathways. And you don’t want to create a poor user experience by pointing the quiz taker to an irrelevant question or dropping them out of the quiz early. We’re almost done. Decide whether or not you want to collect email responses. I think for affiliate quizzes you shouldn’t do this. Your call to action is to send the reader off, via your disclosed affiliate link, to the product they want to buy. You don’t want to make that harder by forcing people to give you their email address at this point. It’s a better user experience, and you’ll get lower drop off through the quiz, if you don’t connect to an email provider. However, this is totally your choice. Having an email can be useful if you intend to drop people into a specific mailing list for that product and send them helpful information in the future. If you choose to connect an email provider, here is where you would do it. Finally, you want to test your quiz. Use the preview function to walk through your quiz several times, checking out all the different branches and making sure you end up at the products you expect. It’s worth getting a friend to test it out too. When you are happy that your quiz is working as expected, you can embed it on your blog or website. Alternatively, you can share it on social media (but be careful that your affiliate disclosures are still present). Many bloggers use a monthly blog checklist to make sure they remember all the different blogging tasks to do on a regular basis. 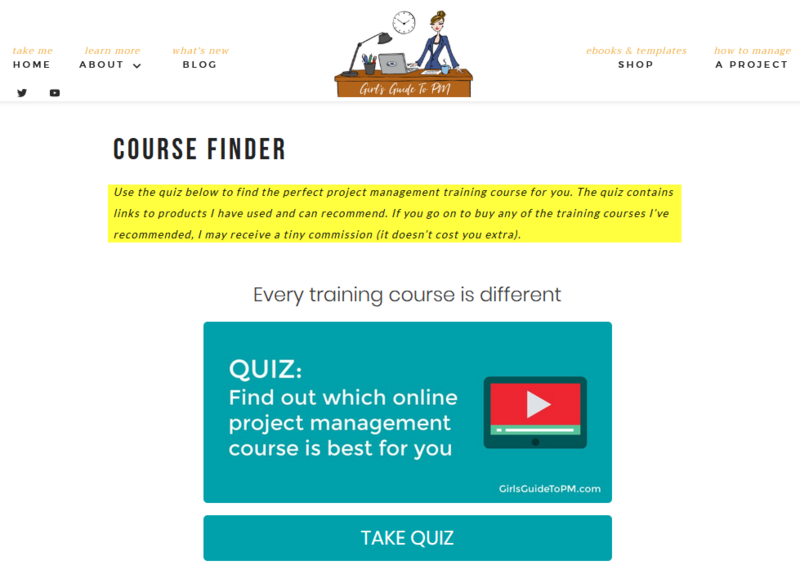 My advice is to add promotion of your quiz to that so you can continually keep it circulating on social media or via email newsletters, your blog and so on. There are quite a few steps involved in making an affiliate quiz, but it can be a helpful way to add value to your readers in a product round up article, and, of course, it can bring in revenue if you get enough people clicking through and seeing their recommended products – and going on to buy them. If you regularly cover products on your site, or find yourself answering the same ‘what should I buy?’ questions in your Facebook group or on email, then being able to direct people to a simple yet powerful quiz will help you offer your readers the best product choices for them. Ready to try this on your site? Create a quiz now. Elizabeth Harrin is the expert bloggers turn to for help on how to get more done in less time. 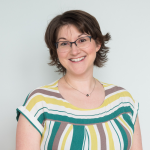 Through her proven program, Elizabeth has helped many bloggers understand their assets, organize their content and save time creating and sharing their work.